The Battle of Galveston, which took place during the early morning hours of January 1, 1863, is widely acknowledged as the most important military event in Galveston’s history. Played out on both land and sea over the course of several months, the Battle of Galveston ended with Confederate forces driving out the Union ships that had held Galveston Harbor since October, 1862. As part of the Union blockade of the Texas coast, Commander William B. Renshaw and his squadron of eight Union ships demanded surrender by Confederate Forces of Galveston Harbor, the most important Texas port, on October 4, 1862. But Confederate Major General John Bankhead Magruder led a successful campaign to retake Galveston early on New Year’s morning, January 1, 1863. Confederate “cottonclads” struck from the rear of the Union squadron. 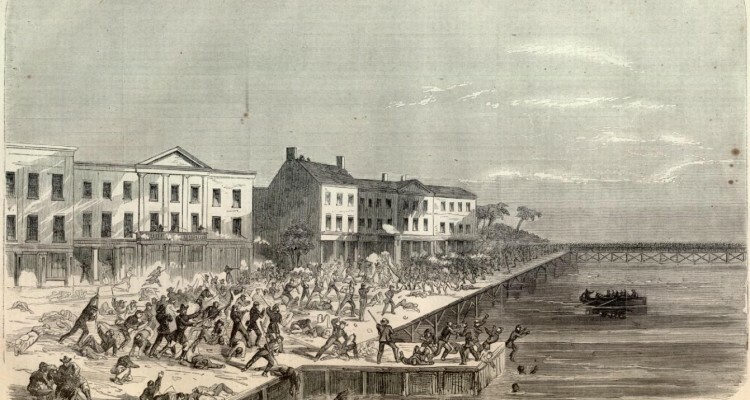 A naval battle ensued with Magruder’s forces retaking Galveston. Confederate losses numbered 26 killed and 117 wounded. Union losses included the captured infantry and the Harriet Lane, about 150 casualties on the naval ships, and destruction of the Westfield. The port remained under Confederate control for the rest of the war. A descendant of one of those soldiers has sent in a guest column with more of their story. My great grandfather, James McDermott, was an Irish immigrant who with his wife Bridget fled the famine in Ireland in 1853 and sailed to Rosebank, Staten Island, New York City. Nine years (and five children) later James enlisted in the Union Navy following the outbreak of the Civil War, and was assigned to the USS Benton. He later transferred to the USS Clifton (a side-wheel ferryboat built in Brooklyn NY in 1861 and then converted to a gunship by the Union Navy) as a Fireman (shoveling coal into the ships furnace). Then in October 1862 Admiral Farragut sent the Clifton, along with 4 other gunboats to the Texas coast with orders to capture the city of Galveston. Apparently the city was not well manned by Confederate troops at the time, and as you know the Union Navy attacked and essentially took control of Galveston (although I believe that they occupied the city by day, but not by night.) When the Confederate forces returned some months later they of course took back full control of Galveston, and they captured the USS Clifton along with many of the Union Navy troops, grandfather James being one of them. Family history says that James was held prisoner at Camp Ford, in Tyler Texas. However our James was not the type to stick around, so he and several others eventually escaped from Camp Ford, and made their way back to Admiral Farragut’s fleet on the Mississippi, where James was assigned to the USS Monongahela. Then in March 1863 the Monongahela joined Farragut’s armada of ships in the battle of Port Hudson, in Mississippi. The Union troops didn’t fare too well in the Port Hudson skirmish, but our James did survive, as did the heavily damaged Monongahela. Family life returned to normal for a few years, until James, while working on a privately owned tug boat (as a fireman) some 3 miles out of NY harbor in the Atlantic, was washed overboard during a heavy storm, and never seen again. Bridget appealed to the Navy for support, since James was an Honorably Discharged Veteran, and she was eventually awarded a pension of $8/month by the Navy. Great article, thank you for writing about it! I am a member of this McDermott family. I know this because growing up I also heard of the story of what Bridget said when her husband returned home. I grew up in Stapleton on Staten Island New York and my father was mark McDermott. Hi cousin Susan, glad you caught this. Your fathers brother Joseph was my dad. He moved from the Stapleton pack and settled in New Brighton, where I grew up. Hello fellow McDermott cousins! Great story, I too am descended from this James McDermott of Staten Island (my g-g-g-grandfather; my maternal McDermott grandmother was born there, the daughter of James Francis “Darby” McDermott) and, though I did not learn about this James McDermott’s exploits during the Civil War until recently, I’ve heard many other stories of my relatives there.